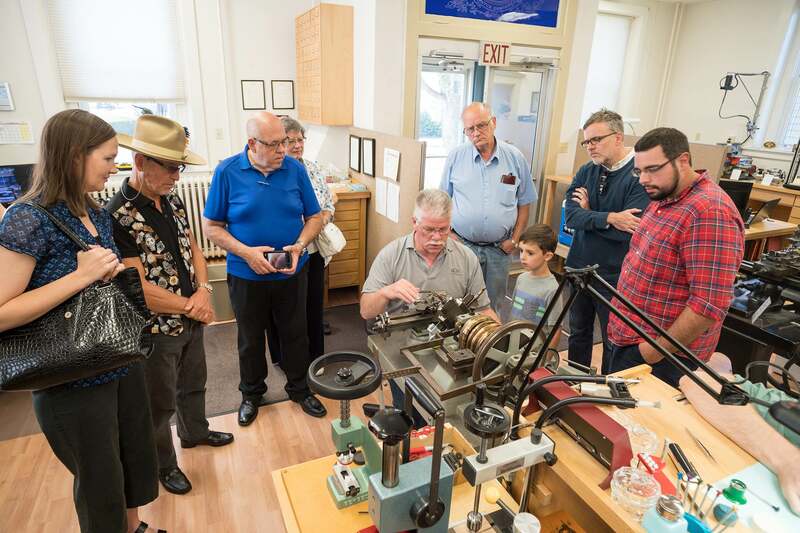 For the unveiling of the new timepieces, Roland Murphy, owner of RGM chose the nearby NAWCC Watch & Clock Museum in Columbia, PA, as the setting. 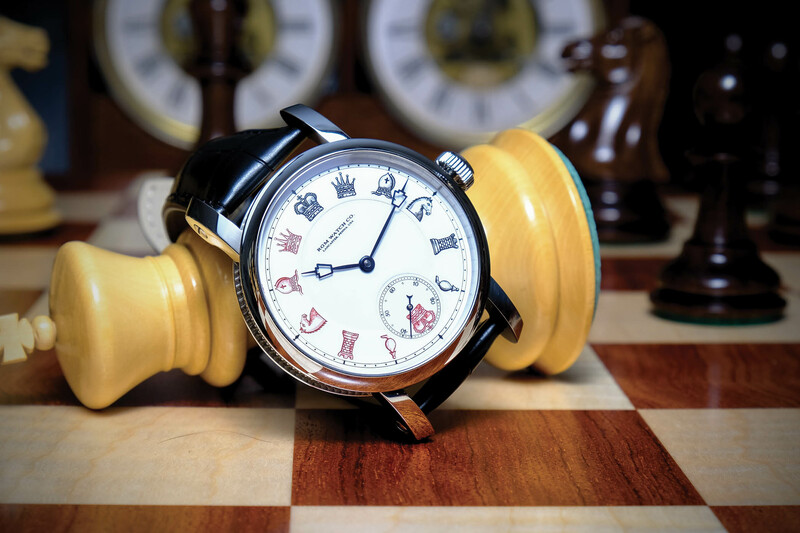 There, the first watch he introduced for the brand’s anniversary – a special chess-inspired piece that was unveiled earlier this year – was also on display. 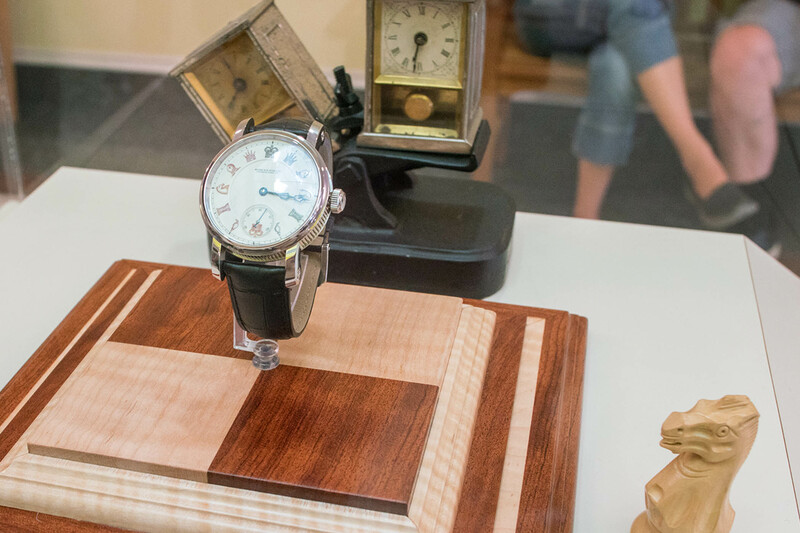 After an impressive guided tour by Murphy, wherein he showed off his favorite clocks and watches in the museum that inspire him, he unveiled the new watches and the new caliber. 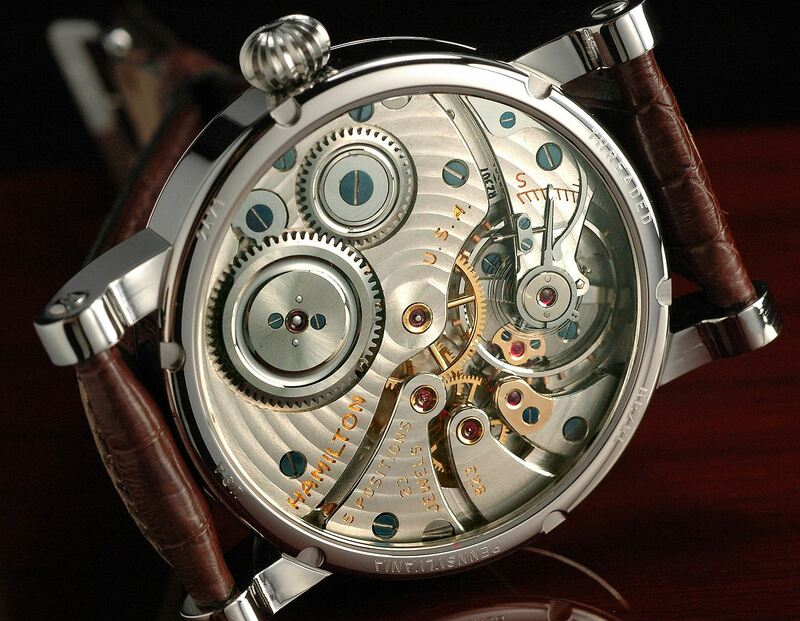 The 801SW caliber is the fourth in-house-made movement from RGM. 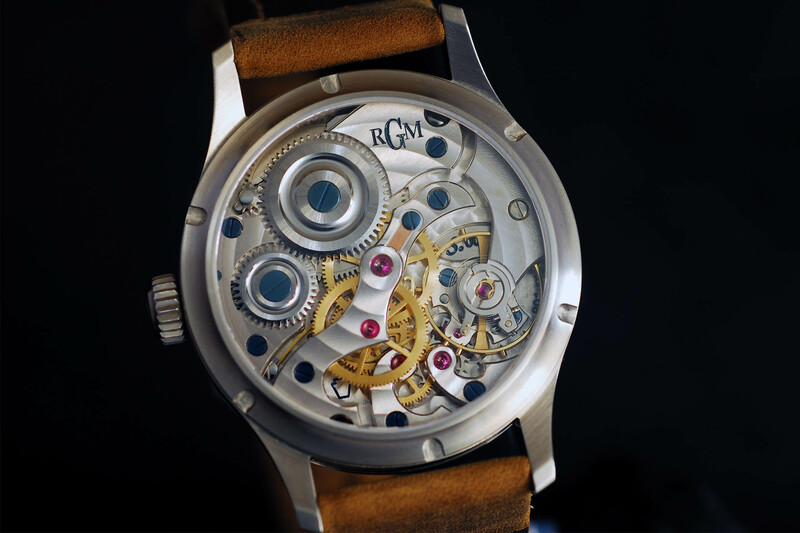 It features a center sweep second hand and is a new version of the original RGM 801 movement. The caliber, inspired by America’s great watchmaking history, is built using a newly devised main-plate in order to accommodate the center seconds function and to make servicing of the watch easier. For this caliber, Murphy reconfigured the typical movement with center second. Whereas most center second movements are equipped with a wheel that is friction fit onto a pivot from the third wheel coming through the bridge, the RGM 801SW caliber combines the third wheel and the sweep drive wheel on the arbor – sitting under the bridge. This double wheel system eliminates the friction wheel method. According to Murphy, even though the new system requires more components and assembly, it is a more reliable construction and makes for better full servicing of the watch. 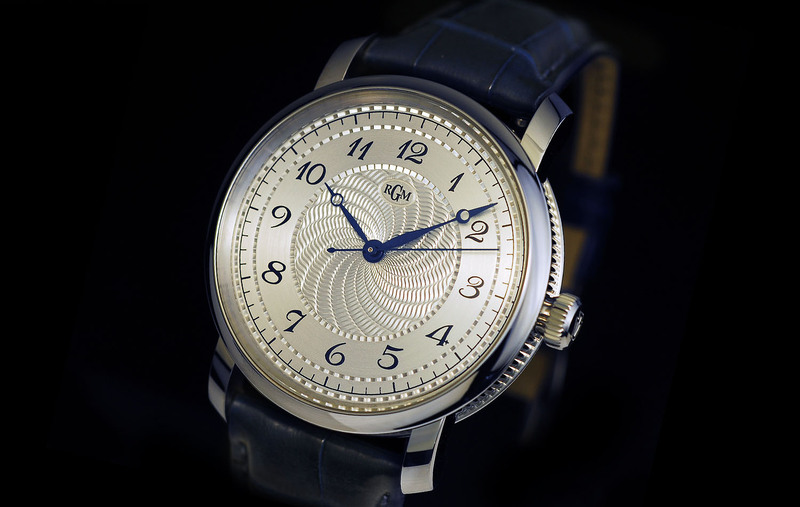 This 42mm watch is being crafted in brushed 316L stainless steel and features a sapphire crystal and case back. 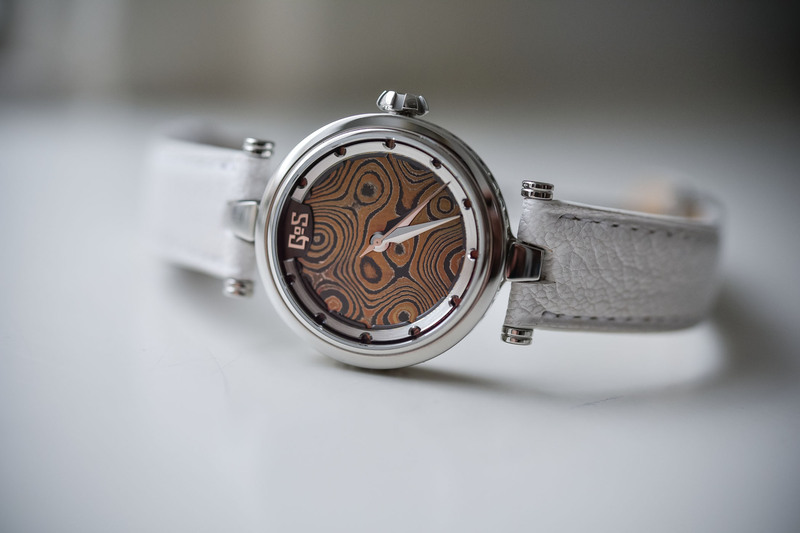 It is finished with a rugged, vintage-looking brown leather strap. 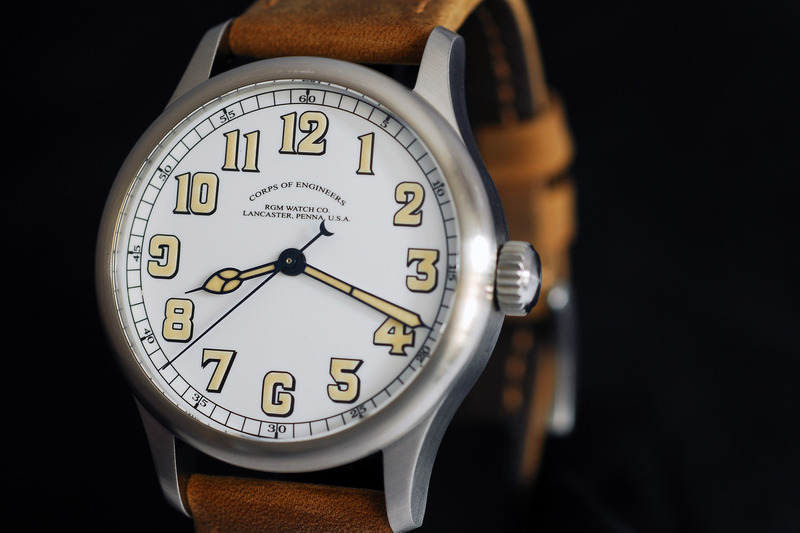 In addition to the new caliber and the 801SW-COE watch, and easily our favorite piece (in terms of looks) of the four watches created for the anniversary, is the Model 222-RR (Railroad), which captivates and delights us with its vintage looks. The round dial features an offset 12:00 position on the dial and the crown is offset at 1:30 on the 41mm stainless steel case. 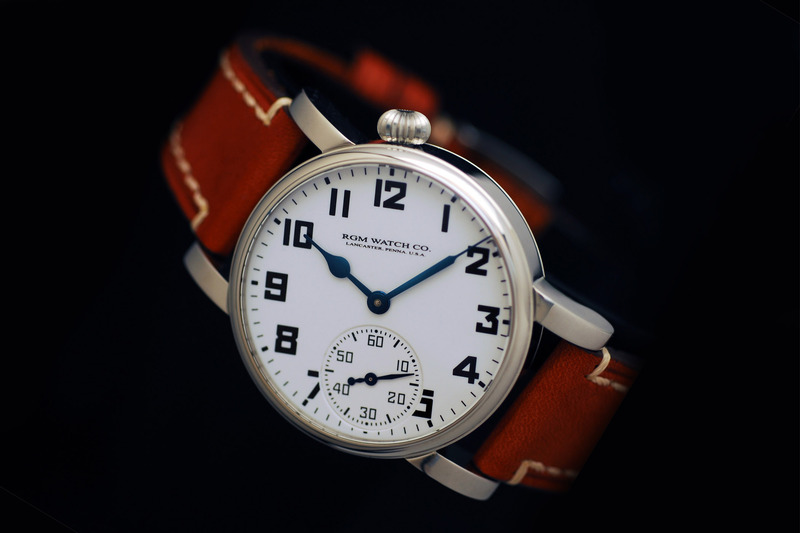 Inspired by the Boxcar style American railroad watches of yesteryear, this watch is a tribute to timepieces of a century ago. 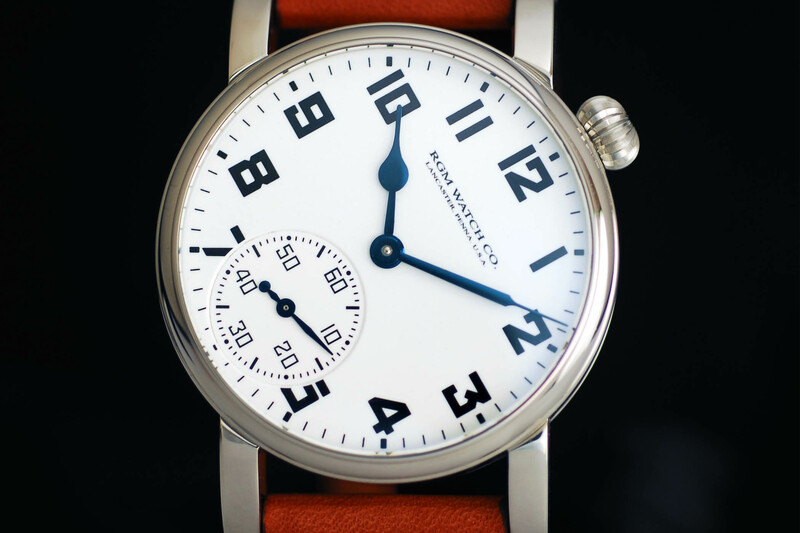 The white railroad-themed Grand Feu enamel dial contrasts magnificently with the blue outer minute track, subsidiary seconds dial at 6:00 with blue numbers and markers, blue numerals and blued steel hands. 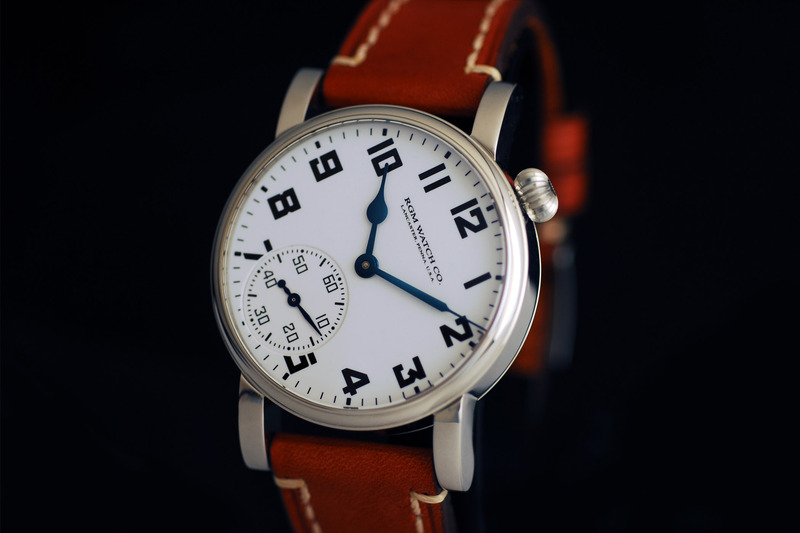 The Model 222-RR is powered by restored Hamilton movements, either the manual wind Hamilton 921 or 923 calibers – much like the other watches in the RGM 222 line. Each Hamilton movement is rebuilt using parts in the finest condition and each component is hand polished on a tin block. 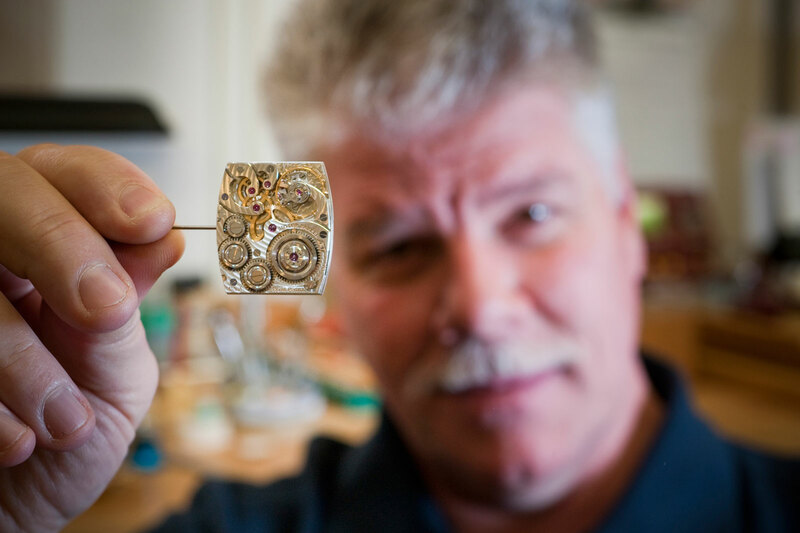 The 921 movement, with 21 jewels, is fairly plentiful, while the 923 movement, with 23 jewels, is less abundant, as fewer than 4,000 pieces were ever made. 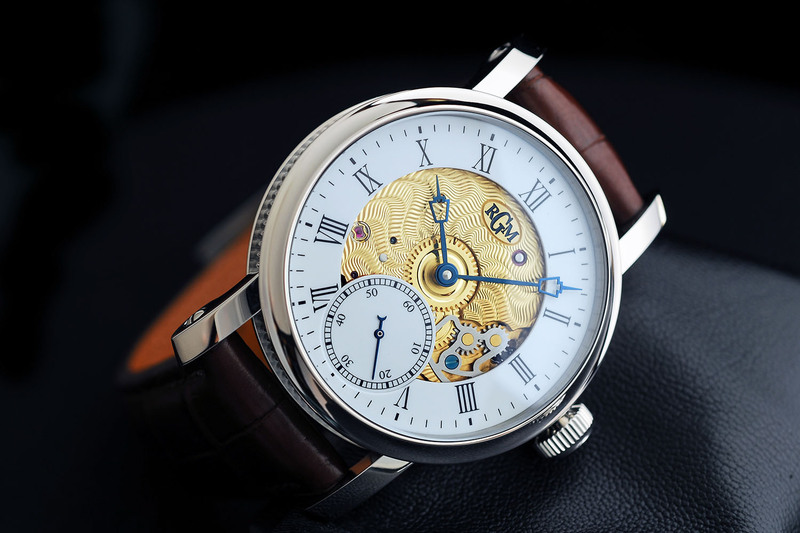 Of course, any anniversary of significance from RGM would not be complete without one classic timepiece, and so Murphy doesn’t disappoint his followers. The Model 25 watch is a statement of elegance and timelessness thanks to the 40mm coin-edged case (similar to the brand’s Pennsylvania series watches) and the stunning dials. 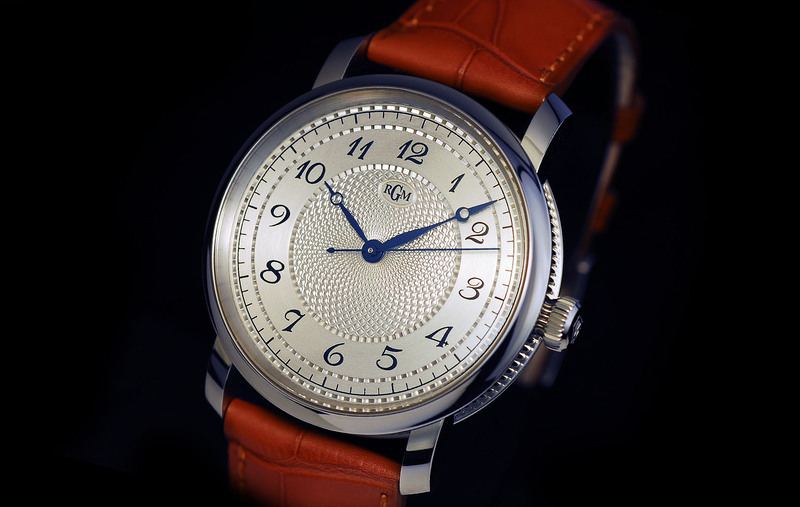 The center of each hand-cut dial features an engine-turned motif done by hand in the RGM workshops. 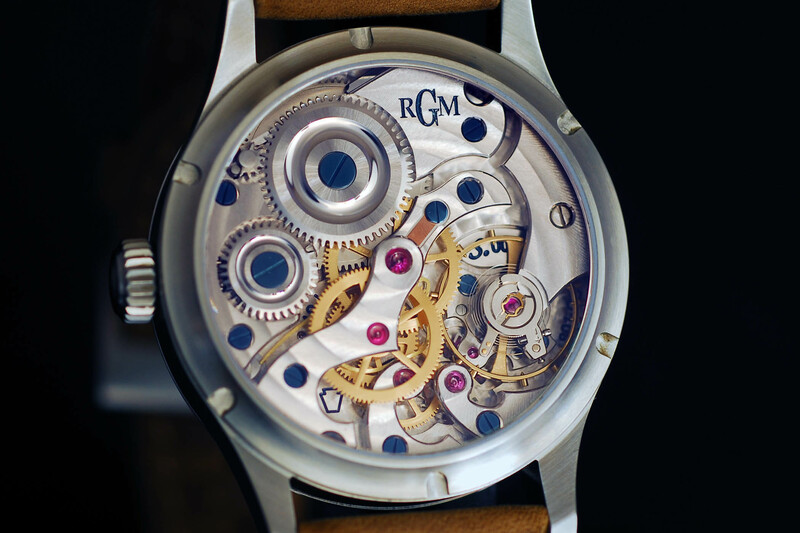 Rose engines and hand-turned designs are a speciality of RGM. 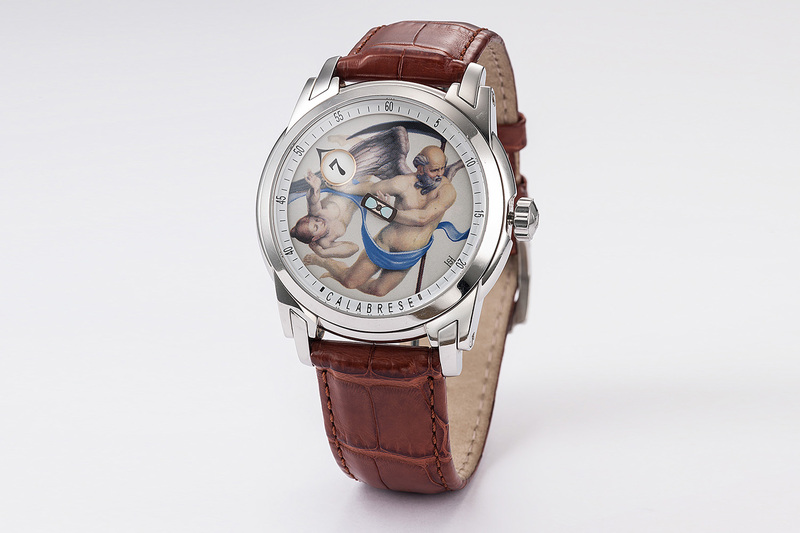 Each dial is a unique work of art because each is made by hand individually. 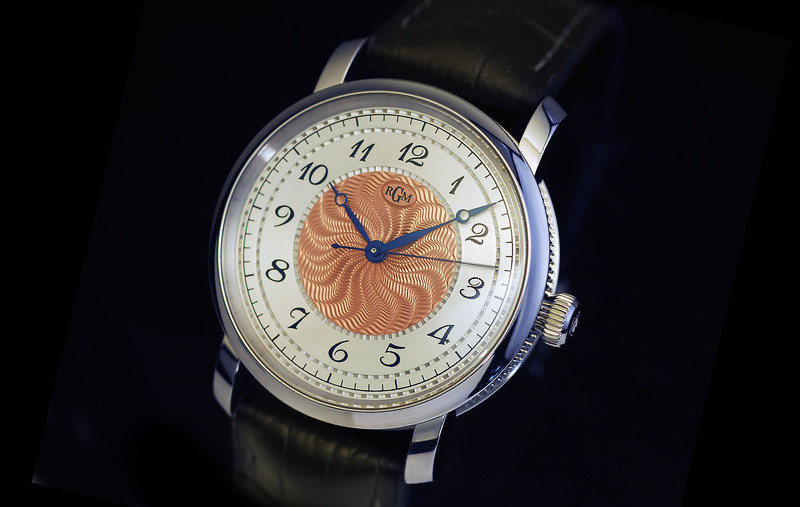 The Model 25 watches are offered with different guilloche patterns such as barley, moray and spiral guilloche and in a variety of metallic galvanic colors, ranging from silver to copper and beautiful royal blue. The 40 mm stainless steel cases for this series are made in America and the movements are Swiss ETA 2892-A2 automatics movements with hour, minute, second and – on certain models – date function. With the unveiling of these new watches, the new caliber and the Chess watch unveiled earlier this year, RGM reaches another new milestone. The 25-year-old American brand has never introduced so many models in a single year – making this a banner celebration. 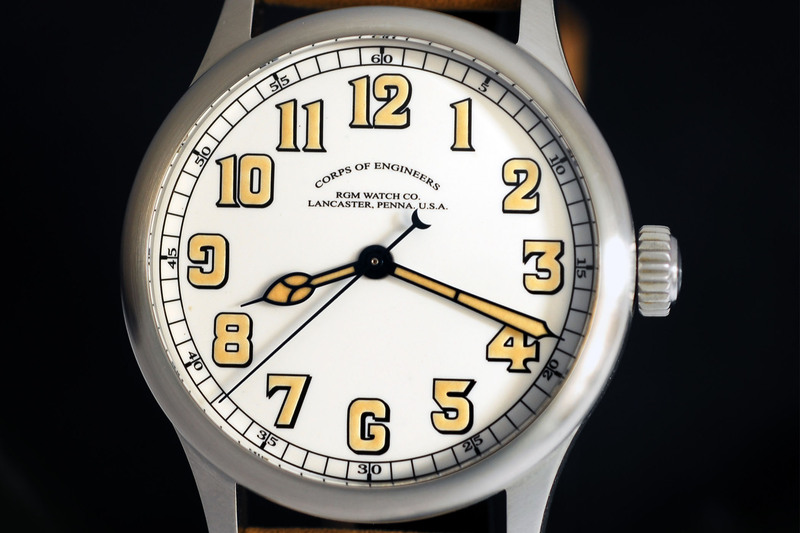 www.rgmwatches.com. This article has been written by Roberta Naas, founder of watch-magazine A Timely Perspective. Roberta is also the author of six books on watches.